History – I love custom orders more than any other order…they make people twice as happy when they can get “their perfect” piece of jewelry. They also inspire and embolden people to ask when they know I’m willing to do them. Unless the beads are more expensive, variations in color or the same bead style in a different finish are typically no more expensive than their original listing. These two are the same price, so don’t hesitate to ask about your favorite design and how it can be personalized for you. To see all the variations of the Celtic Purple series, go here. 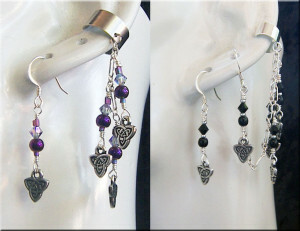 It’s variation, Celtic Darkness Earcuff & Earring set is here.